Today in the mail I received the most recent gen prototype of Ed Verdugo’s GRSC 1-6x combat rifle scope. I also received the Vortex Viper PST 1-4x. With six test scopes on hand, this should be a heck of a shootout. In the interest of full disclosure, it is important to note that I am reviewing a prototype of Ed’s scope here and not a final production version. While it is mostly the same as the production version is slated to be, this prototype has not undergone the full lens multi-coating process and therefore the production version should be optically better. It is my understanding that in all other ways the production version will be the same. The following are the lineup of scopes that were used as references for the GRSC 1-6x in this review. 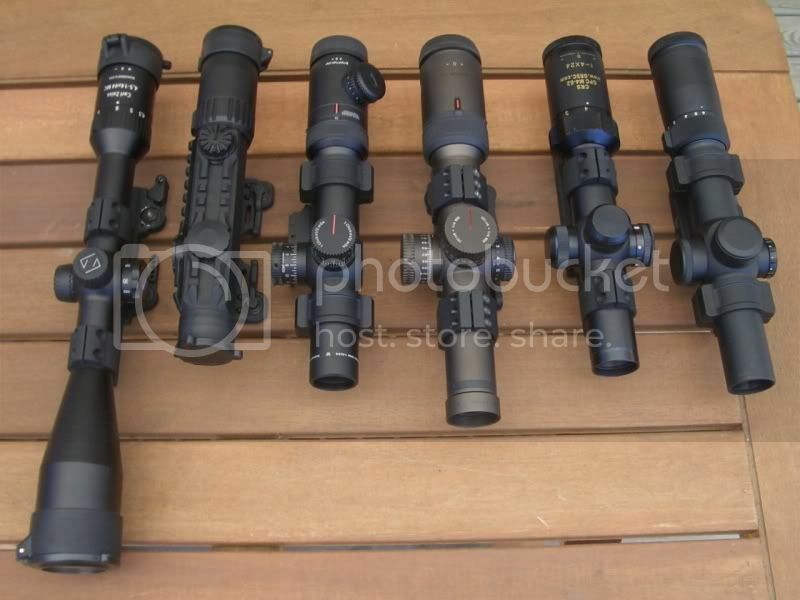 From left to right: Zeiss conquest 4.5-14x44mm, Leupold CQ/T, Vortex Viper PST 1-4x, Vortex Razor HD 1-4x, GRSC Korean-made 1-4x (mine was a prototype), GRSC Japanese-made 1-6x Prototype. Background: A few words about Ed and how this scope came to exist before we get to brass tacks. Ed is a former Special Forces soldier who, since leaving the armed forces and becoming a fireman, has dedicated much of his hobby time to improving our war-fighters’ gear. No doubt you have seen (and probably used) one of the many receiver endplate sling attachment points he invented. You have probably also used a sling that borrows at least a few of his innovations in that department. A few years ago, Ed became interested in improving our troops’ sighting systems. He designed, and has subsequently improved upon, a combat reticle. He has since attempted to have that reticle included in a combat-worthy scope, with varying degrees of success. At least six scopes on the review table at the beginning of this thread have all or part of Ed’s reticle design in them. 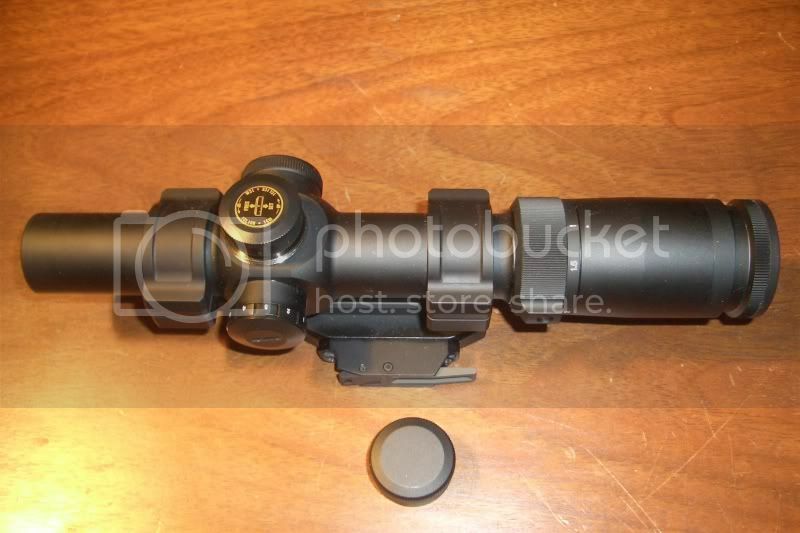 This particular scope is one that not only has Ed’s reticle, but also is manufactured for and sold through Ed at GRSC. He has put much of his own treasure on the line to bring such a scope to pass. For a guy with seven kids and an ex-wife, that cannot have been easy. It is notable that this is the third scope Ed has had manufactured using his reticle. Originally there was an unsatisfactory Chinese GRSC scope made by Millet for Ed. Next came a Korean-manufactured 1-4x scope that many of you have or have seen. That scope I reviewed a year or so ago and has been in production for some time since. Ed will continue to produce the 1-4x even after this 1-6x is released. Ed’s 1-4x Korean is in the review line up today (referred to as the GRSC K) so I will have the ability to compare the two. This will allow folks of different budget constraints to be able to afford a scope with Ed’s excellent reticle. Today’s 1-6x is of Japanese manufacture (It will be referred to as the GRSC J.) And yes, for those of you who follow the behind-the-scenes hush-hush world of who made what for whom in Japan, it is that manufacturer you are probably thinking of who makes many of the high-end Japanese scopes for several different companies. So, when you ask is this comparable to “X” brand I have been looking at that is also Japanese-made, it’s pretty likely that it was made in the same factory. Physical Description: The scope I have before me is a very no frills machine. It is flat black and devoid of any stylistic influences. The overall impression I get when handling it is of mass and simplicity. This despite the fact that the scope would not even be particularly heavy for a 1-4x let alone a 1-6x and does not lack any of the controls of its competitors. All the controls move smoothly and click when theyre supposed to. The power ring, euro-style diopter, and illumination move with the amount of force I have grown accustomed to expecting. The turrets move with significantly less force than expected. It is a good thing they are capped. Speaking of that, Ed informs me that the production versions are expected to have spare batteries under the cap as the 1-4x did. I still love the battery cap idea. So simple and so genius. Reticle Description, Explanation, and Testing: As is noted in many of my other reviews, few 1-(n) power optics have a reticle that realistically offers a high speed and high hit probability over that full range of engagement distances. 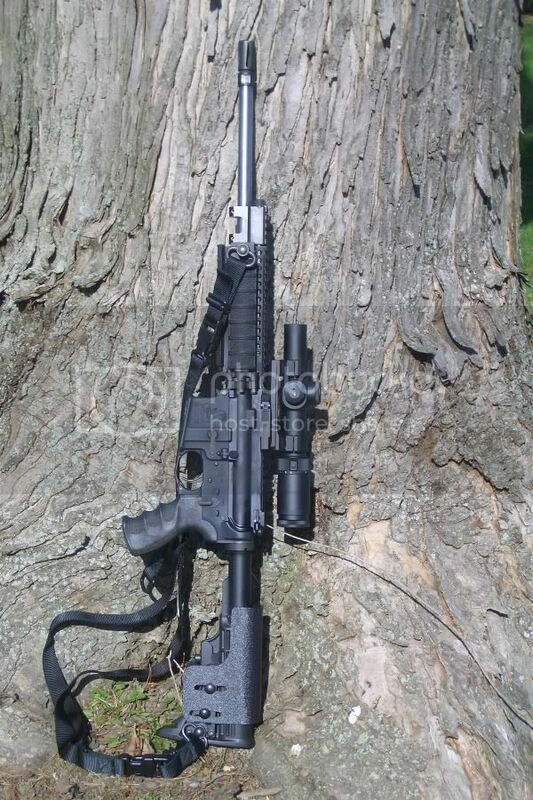 A 5.56mm assault rifle is a very effective close quarters tool, but is also effective out to a full 800 yards. This is provided the user knows how far the target is and where to point the gun. Many optics use close quarters reticles like circle dots that are fast up close, but limited to an effective range of 400 yards or less. 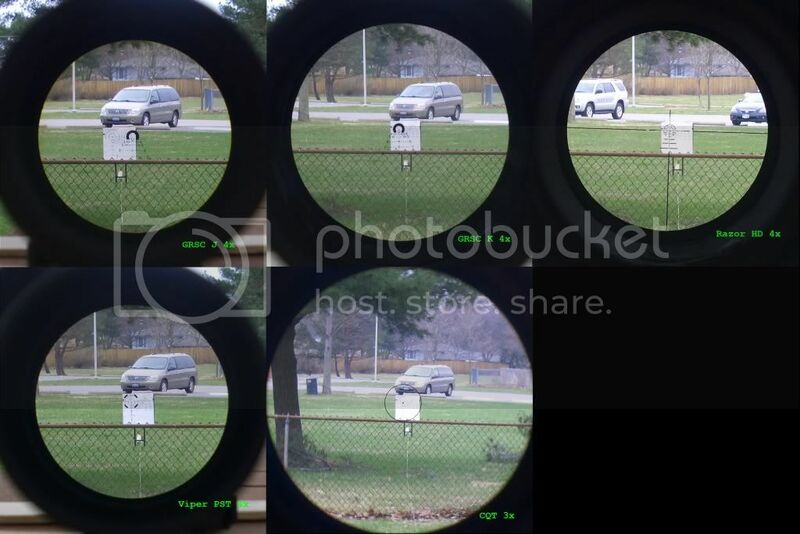 Other optics use mil dot type reticles that are not particularly fast up close or at range. Though capable of very precise estimation of the range of targets, mil dots require mathematical calculations to accomplish this. They further require the user to adjust the turrets to compensate for range and drop once the calculations have been made. Though this might be a serviceable, if laborious, procedure when engaging targets that are unaware of the user’s presence, it is not a viable option when the targets have already engaged the user. No one is going to pull out his calculator in a firefight. Where mil dot type scopes really shine is at range estimation out beyond 600 yards using multiple objects for ranging in order to get a very precise distance. It takes a long time to accomplish this, but it can be done with great precision with a mil dot. The reticle in this GRSC scope is not a long range sniper scope reticle. It is one of the few reticles designed to accommodate both close quarters and mid-range engagements and is well-suited for the 1-(n) power scope class. It has features for snap shooting, ranging, bullet drop, windage, and moving target leads. Allow me to walk you though the functions so that you will understand how it works. 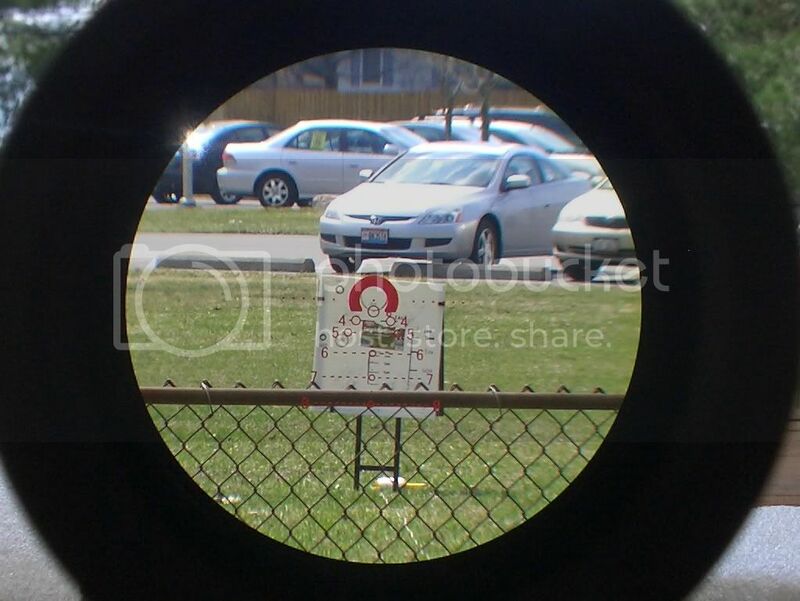 Please refer to the close up image of the reticle (below) while reading this section. I promise it is not that complicated and is well worth understanding. The large central horseshoe that surrounds the 100-yard zero point has an inside diameter of 10 MOA. This corresponds to the size of a human head at 100 yards and serves to range that distance. The horseshoe is a massive 4 MOA thick. This is so that when dialed down to 1x, it will appear as a dot for close quarters combat. This scope is front focal plane so as you decrease power, the reticle appears progressively smaller to the user. Ideally, this dot would be illuminated brightly enough to be used in daylight. Below the 100-yard zero you will see a series of dashed lines and circles labeled 4, 5, 6, 7, and 8. Each circle has an inside diameter of 10 inches at the yardage it corresponds to; with line 4 being 400 yards and so on. Aiming points and ranging circles exist for 10 as well as 300 – 800 yards. 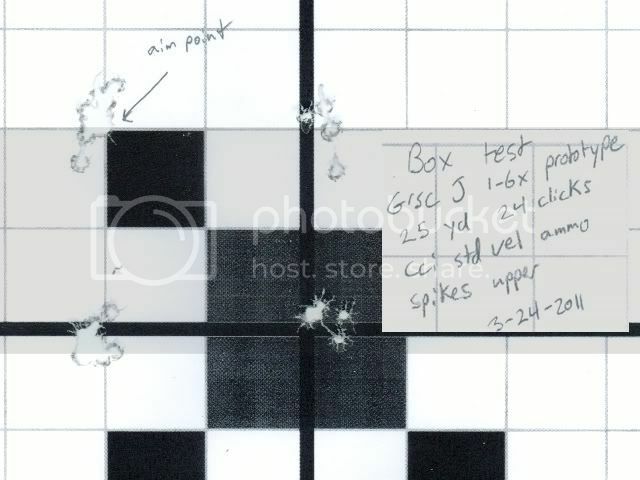 These aiming points are based on the bullet drop of an M855 cartridge fired from a 14.5″ barreled M4. You will also notice that at each 100-yard increment from 400 yards on, there is a dashed line. Each dash and each gap are equal to 10 inches at the corresponding range. This allows you not only to range larger objects, but also to compensate for windage and moving target leads. Since our number system is base 10, it is particularly easy to count the correct amount of dashes from center to account for windage or target lead. By now you have noticed that almost every feature in the scope is based on 10 inches at the appropriate range. For this reason, I like to refer to this reticle as Ed’s ‘base 10 reticle’. There are also a few other less relevant features on the scope that you may be wondering about. The dots to the right and left of the horseshoe are, in fact, mil dots. They are mostly there to level the scope during mounting and to ensure level hold of the rifle. There are also dots down the vertical centerline of the scope between 100-yard drop increments. They are to aid you when firing at targets substantially between ranges and are not positioned at any particularly important division points. The view through the GRSC J scope at 1x with maximum illumination. Not how the big thick horseshoe you saw at 6x is now essentially a dot with all finer scope elements unnoticeable. This is the goal of Ed’s reticle. To essentially dial down to a red dot scope at 1x. For the assessment of this unique reticle I have made up a special target. On it I have placed properly sized circles and correctly spaced drop lines to assess how true to the specs the reticle’s features actually are. Since this scope is designed to have bullet drop, windage, and moving target lead compensated for with the reticle instead of with the adjustments, it is vital that the reticle dimensions are to spec. At this point, I have already compared the GRSC’s spec drop numbers to several references for the M855 cartridge and I am confident that if the reticle dimensions are in reality as they are on paper, this reticle will be an excellent design with regards to both bullet drop and ranging. In testing this reticle, I found it to be slightly different in size than the previous GRSC K 1-4x scope. The bullet drops and linear items on the reticle are exactly to spec on both reticles. 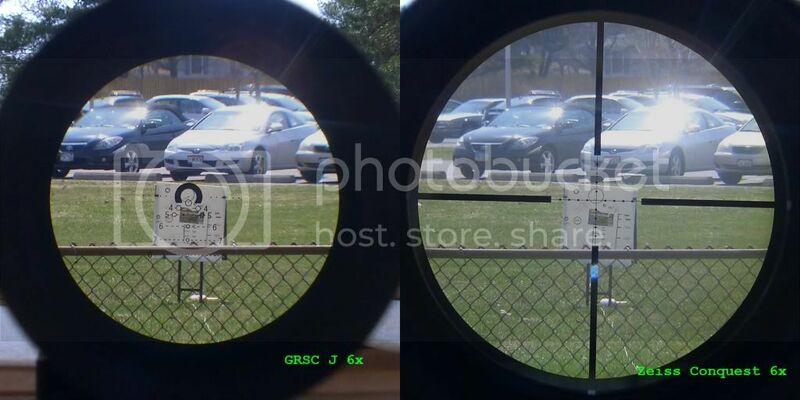 However, on the new GRSC J scope, the circles are about 5% larger than on the GRSC K. This allows a little halo of open space between the circles on the test target and those in the reticle. Now the circles on the reticles are supposed to be for sizing folks’ heads at range. Given that heads do not come in standard 10″ sizes, 5% one way or the other is probably not a real deal breaker. I’m still going to mention it, though, since I like things neat and tidy and would prefer they all subtended 10″ at range. I also mention it because like many other folks, I have the good fortune not to have to shoot at folks’ heads. Instead I shoot at pieces of paper that are often nicely marked in inches. Having circles of exactly 10 inches at range was quite convenient for me when ranging targets with lines every inch. 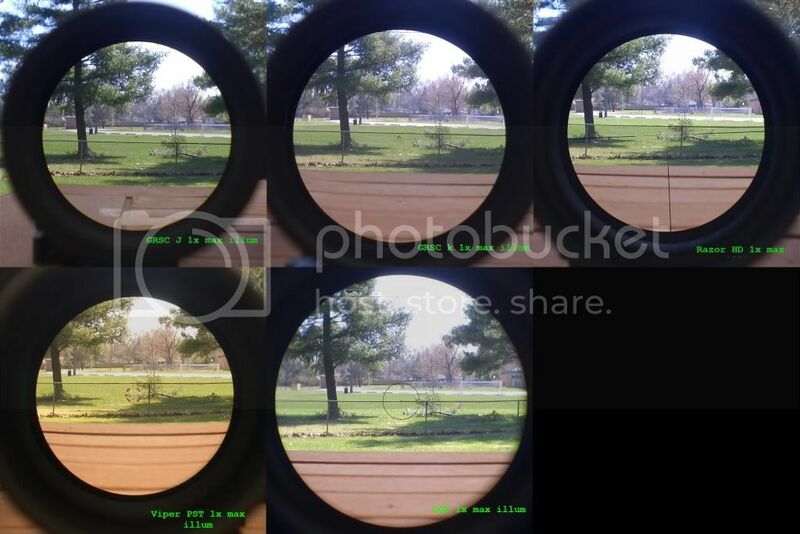 Comparative Optical Evaluation: As I set up the scopes on my patio table for the optical evaluation, the difficulties in creating a 1-6x scope were very much on my mind. I remembered back to last year when I reviewed the March Tactical 1-10x scope. It had a very limited exit pupil and a great deal of difficulty with curvature of field at 10x. Clearly, sacrifices had to be made in the optical design to enable such a giant power range. With both S&B and Premier reticles undergoing a redesign of their 1-8x scopes because they were unsatisfied with their initial designs, I wondered how this GRSC would handle the challenges of increasing the power multiplier to greater than 4x. On the whole, I am very pleased. Clarity wise, the GRSC J came in a very close second to the Vortex Razor. At 4x the scopes were indistinguishable and at 1x, I think the Razor had a slight edge. Given that the GRSC J that I have is a prototype without the final lens coatings, I was amazed. Perhaps in the final production version it will even best the Razor. It is also notable that since the GRSC J goes up to 6x, I was able to compare it to my Zeiss Conquest with both at 6x. The GRSC was significantly clearer, though at 6x it begins to show a little curvature of field and chromatic aberration. Neither of these effects is noticeable at 4x. The field of view of the GRSC J is very close to that of the two Vortex entries. Not outstanding by any stretch, but since all appear very flat and clear at 1x, perhaps it is worth the sacrifice. All in all I am very impressed with the GRSC 1-6x’s optics. Given the greater challenge inherent with the greater power range, I would have expected to sacrifice more than a slight bit of field of view. 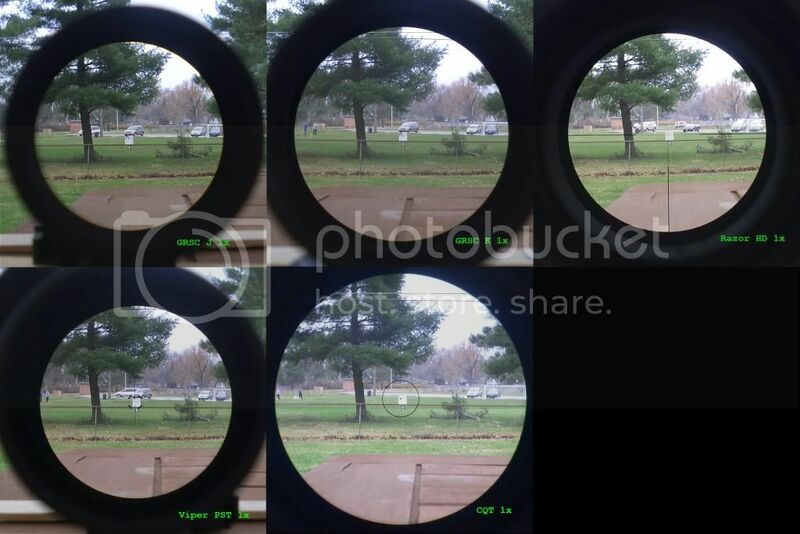 Below are some compilation photos that may help you evaluate the relative field of view and clarity of the scopes in today’s lineup. Please pay particular attention to the soccer goal in the 1x photo for a field of view comparison. In the 4x photo, the fence on the right side and far tree on the left are good benchmarks. All of these photos were taken in relatively low light (evening) to enhance optical differences in the scopes. The target is 50 yards away and is calibrated to the GRSC and EBR-556 reticles at that range. Scopes were not mounted on a rifle, which is why the soccer players don’t look worried. Exit Pupil and Eyebox Discussion: First, lets discuss the exit pupil. The exit pupil is the size of the disc of light at the point at which it is focused for your eye. Assuming you are using this scope for close quarters work and you are moving about, your head will not be completely stationary regardless of how good your cheek weld is. A larger exit pupil will allow you to keep view of the object through the scope despite your movement, though it is notable that due to parallax error, the reticle will be exactly where it should be when your head is far off center. People refer to range through which your eye can move about and still get a good image as the “eyebox”. Obviously, exit pupil is a very important specification on 1-(n) power scopes. If my experience with the March Tactical 1-10x is any indication, exit pupil is also one of the most difficult statistics to preserve in a scope design when increasing the power range. Mathematically, the largest an exit pupil can be is the diameter of the objective lens / the magnification. I have noticed a trend for scope manufactures to simply list the results of this mathematical formula as their exit pupil. Roughly half of the makers in the table do this and dollars to donuts, they are all lying. Exit pupil can be roughly tested by placing a brightly illuminated object at some distance from the optic and measuring the disc of light transmitted through the scope at its smallest point. Below is a photo of my measurement setup. What I found measuring exit pupil corresponded well to my experiences testing the scopes by bobbing my head around a bit. Below are my measured exit pupil values. With regards to the GRSC J, the values I measured were pretty much identical to the ones published by the folks at GRSC. These values are also a good deal better than I expected. Despite its greater power range, the GRSC 1-6x does not have the smallest 1x exit pupil in the lineup. Furthermore, it is really not very far off from the GRSC K or the Vortex Razor. Despite being a 1-6x, its exit pupil is not outside the range one would expect from a 1-4x. This is a considerable and perhaps surprising win in the close quarters department for this scope. Illumination Subjective and Comparative Evaluation: It is no secret that illumination that is not “daytime bright” has been one of the banes of the 1-(n) power scope class. It is challenging to light the reticle in a true optic (i.e. not a red dot) brightly enough to be viewed in the daytime sunlight. Often, the reticles of 1-n power scopes simply appear black in bright sunlight. The problem of lighting has been doubly problematic for 1st focal plane scopes for two reasons. Firstly, the reticle is farther forward in the scope body requiring the light to travel further and through more lenses to reach the eye. Secondly, the reticle appears smaller to the user as the power is decreased. Since the illumination brightness is most important at 1x, this is very problematic. Whether the GRSC 1-6x will appear daytime bright to your liking is not really a question I can answer for you. What I can tell you is that on full go it is easily the brightest scope in this lineup at 6x and probably second to the 2nd focal plane Vortex Viper at 1x. This is quite the feat since I find it bright enough for illuminated daytime use, though as many will note, it is nowhere near as bright as an Eotech. I am reviewing this scope on what can only be considered an ideal shooting day. Little wind, sunny, cloudless, but not overwhelmingly bright (it is Ohio in springtime), and cool enough that mirage is non-existent. How bright this scope will appear in the blazing sun of a desert in Iraq with the sand reflecting so much sun it doubles the already impressive ambient brightness is beyond my ability to test. I wouldn’t bet on the illumination being visible in those conditions though. The illumination in this scope is accomplished with an 11-position rheostat on the left side of the saddle opposite the windage. The rheostat has an off position between each on. My only complaint about the setup is that access to the CR2032 battery cannot be considered tool-less. The battery cap is not knurled and I cannot turn it open barehanded. Mechanical Testing and Turret Discussion: In order to test the mechanical properties of a scope such as the accuracy, repeatability, and independence of the adjustments; I will be performing a box test and a power change test. These tests will be done using my Lothar Walther barreled Spike’s .22lr upper. This gives me the data desired without the time and expense of making up match .223 hand loads. In the first target, you will see a simple box test. For those of you not familiar with box tests, a box test is performed in the following manner. Zero the scope and shoot the first group. For the second group, you move your adjustments a specified distance to the right (I chose 24 clicks because that is what I use for 1/2 MOA and .1 mil is closer to that than 1/4 MOA), but you still aim at the original point. For the next group, you move the adjustments the same distance down, but again shoot at the original aim point. You then adjust back left to shoot and finally back up for the final group. The result should be a square box on the target with the last group on top of the first. This test will determine not only if your scope properly returns to zero, but also if its adjustments (right/left and up/down) operate independently of each other (i.e. adjusting left does not also adjust slightly down or up). I also used this test to asses whether the adjustments were moving the point of aim the amount that they claimed to be (i.e. 1/4 MOA adjustments move the point of aim 1/4 MOA and not 3/8 or some other amount). The target below was fired at 25 yards with the scope set to 6x. The point of aim for all groups is marked. Since the adjustments for this scope are in mils and my target in inches, there is no relation between the boxes and where the groups should pattern. After shooting this box test, I was obligated to break out the calculator and scale to find out if what I was seeing was actually correct. I am happy to report that not only are the adjustments independent and repeatable, but they are also accurate .1 mil adjustments. I need to make up a target calibrated for mils at yardage. A strange combination that only an American could need. This next target is a power adjustment target. On the target, each group represents a group fired at one of the two power extremes of the scope. No changes are made to the scope’s adjustments when firing these groups. Each group is fired using the upper left corner of the respective boxes as the point of aim. A properly performing scope should show the same relative position of the center of each group to its target box. A scope whose point of impact shifts when the power is changed will show a corresponding shift in the group relative to the aim point. The only scope to ever pass this power change test totally unscathed was the Vortex Razor. The GRSC 1-6x comes pretty close though. 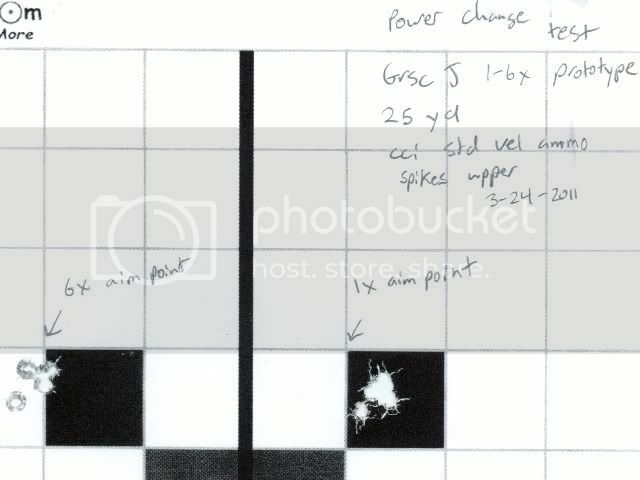 It shows a point of aim shift of about 1/3rd of an inch at 25 yards. This is better than average for the scopes I have tested and probably not problematic given that zeroing and all precise shooting is done at high power. A shift of around 1.3 MOA when switching to 1x for close quarters is probably not a big problem. Lets talk turrets. Once before, I remember saying that I thought that the best turrets possible on a 1-(n) power scope would be the ones that are misplaced on my Zeiss Conquest. They are small, tool-less, capped, and pop up for setting the zero without tools. I have a new favorite. The turrets on the GRSC J are also capped, tool-less, and pop up for setting zero without tools. They exceed the Zeiss in that they are very smooth to use and are well-labeled with increments. Though they are a little larger and heavier than the Zeiss, they are still smaller and lighter than most of the exposed sniper style turrets you see proliferating on many 1-4x scopes. Although I admit to wishing these turrets were 1/2 MOA and not .1 mil; it is not really very important, as compensation for windage and bullet drop are accomplished with the reticle on this scope. Close quarters testing: The GRSC 1-6x was part of my very first formal close quarters testing exercise. I have received many requests for my opinion regarding which optics are the fastest at 1x. This led me to start testing specifically to that end. 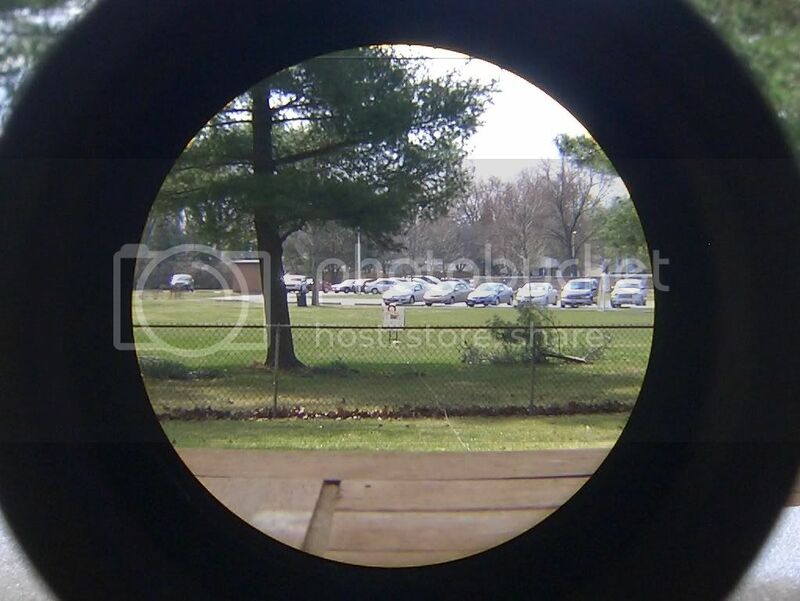 The testing consists of a display of vital-sized targets between 10 and 25 yards away that are engaged from a variety of positions as quickly as possible. The targets are audibly reactive, making hit identification easy. It is not unlike some stages of three gun competitions except that, being as cheap as I am, I use an airsoft. 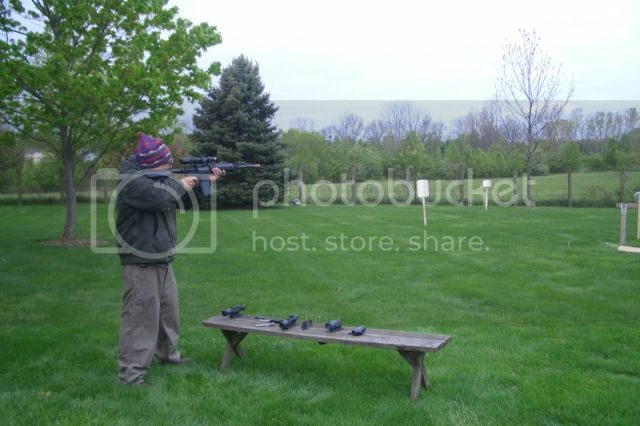 The airsoft also allows for targets that move since having someone down range poses no safety hazard beyond welts. This course of fire was run though by several individuals of varying abilities in order to get as diverse a set of opinions as possible. In the future, I will be writing a composite article with generalized recommendations and guidelines for picking close quarters optics, but for now I will be focusing more specifically on the GRSC. The specific scopes used as references in evaluating the GRSC’s close quarters performance were: a Leupold VX-6 1-6x, Leupold CQ/T, Elcan Specter DR 1/4x, Nikon M-223, and a cheap Simmons red dot. Individual opinions of and performance with each optic varied. This was especially true of the red dot, which rated as high as second for one reviewer but which was last for many. Testers were less split on the GRSC. It took home first place in the overall voting and never scored less than the middle of the pack. I, personally, had it ranked second behind the Elcan. The best aspect of the GRSC for close quarters is the reticle. GRSC takes full advantage of the capabilities of glass etched reticle technology. It eschews all legacy elements such as crosshairs which were once necessary with wire technology but now are often used for the sole reason that they have been used in the past and are familiar. Instead, most of the field of view of the GRSC is clear at 1x. All the reticle elements are clustered into the center. This allows for an uncommonly good view and unobstructed view of the field of fire when moving the rifle quickly. It also aids in a natural and seamless meshing of the images recorded by your right and left eye. All of the testers preferred the GRSC reticle to all others for use at close quarters. As mentioned in the optics section, the GRSC offers not only good clarity, but also, a very flat field of view at 1x. Our close quarters testing reveled this to be of paramount importance for fast 1x use. Scopes with a great deal of distortion at 1x did not allow for good two eye synchronization and were therefore slow. The GRSC allowed for very good synchronization and did not appear to suffer greatly from its small field of view at 1x. Part of the benefit of being able to use both eyes is a greatly enhanced field of view anyway. I have mentioned before, in the illumination section, the GRSC, while bright for its class and focal plane, is not daytime bright. This became especially apparent in close quarters testing. Most of the testers preferred to use it with no illumination at all because the stark black was faster than a somewhat illuminated reticle. We were tough on this scope in our testing, pitting it against several optics that featured daytime bright dot style illumination. 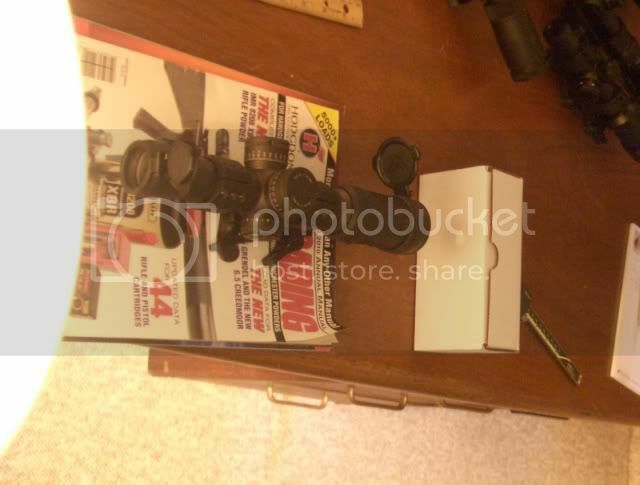 These were the Leupold VX-6 1-6x, the Elcan Specter DR, and a Simmons red dot. I expected that the GRSC would trail these because of the difference in illumination schemes. That was not the case. It turned out that a daytime bright red dot is not as important as a good flat field at 1x that allows for proper two eye synchronization, an uncluttered reticle, and a centered reticle (red dots reticles are typically not at the center of the field of view.) The GRSC, without illumination, was easily preferable these daytime bright illuminated optics with the sometimes exception of the Elcan, which enjoyed many of the same advantages at the GRSC. Summary: The GRSC 1-6x has exceeded my expectations. It’s optics are of comparable quality to the Vortex Razor HD, Leupold VX-6, or Bushnell Elite Tactical. Its mechanicals are solid and reticle is still the best in the business for this class of optic. Furthermore, despite the lack of daytime bright illumination, the GRSC was still scored top marks in the close quarters testing being preferred to all other options by most of the testers involved. I expect that, should the scope prove as durable as it appears, it will be well-received by the .mil guys overseas. I am sure Ed is very proud. The short, 2 year, warranty period, low illumination, and relatively small 6x field of view are the only down sides to this excellent optic.